Nationaal archief, the Dutch National Archives, also keep the archives of Zuid-Holland. Address: Postbus 90520, 2509 LM Den Haag, The Netherlands. Phone: +31 70 3315400. E-mail: info@nationaalarchief.nl. Gemeentearchief Rotterdam, the municipal archive of Rotterdam. Address: Postbus 71, 3032 CG Rotterdam, The Netherlands. Phone: +31 10 24 34 567. E-mail: not published, use the contact form on the website. Gemeentearchief Den Haag, the municipal archive of The Hague. Address: Spui 70, 2511 BT Den Haag, The Netherlands. Phone: +31 70 353 70 42. E-mail: postbus@hga.denhaag.nl. Internet resources Zuid-Holland, an index to the many available online resources for Zuid-Holland. There are regional and local databases for Rotterdam, Den Haag, Leiden, Delft, Vlaardingen, Schiedam, Groene Hart, and others. 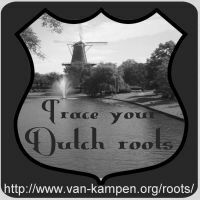 FamilySearch, the website of the LDS (Mormons) has many Zuid-Holland records and scans. Illustrations, images and sounds, the online image catalogue of the Rotterdam Municipal Archives. The Schiedam city archive is present on flickr. Graftombe has indexes of many cemeteries in Zuid-Holland. Register to order photos of tombs. Online Begraafplaatsen (Online Cemeteries) has images of tombstones of several cemeteries in Zuid-Holland.